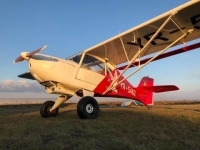 Can anyone provide me the formula for calculating the Cg on the Avid taildragger? I am wondering if anyone had instaled a Bendix Transponder and where exactly. Any ideea could help. I am considering to change my Rotax 582 to Rotax 912 UL, can anyone recommend me where to buy an engine mount for it?